An anchor is an attachment point you can use to bind one or several props to a specific location that is predefined by the anchor. A prop is a game item that will be attached to an anchor. It could be a stick held within the character’s hand, a helmet attached to the character’s head...the possibilities are endless. Props are easy to turn on or off, and easily swappable from within Harmony or Unity. 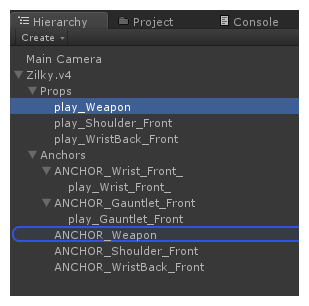 Open up your character in the Hierarchy view to have access to both the props and the anchors. Click on the prop you wish to attach, and drag it onto the appropriate anchor. Repeat these steps for each prop and anchor in your project. In the Inspector view, under Frame, you can select which frame you wish to show. If you only had one drawing in your prop, then you will not have multiple options. 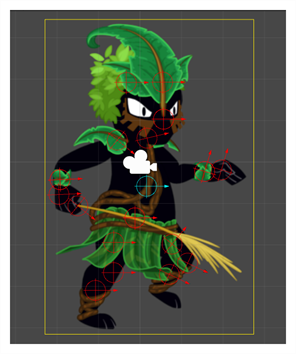 If part of your character is cut off by the plane of the character, now that the props are showing, you will need to regenerate the mesh. To do so, select your GameObject. After this is done, go to Inspector View > Render > Generate Mesh.